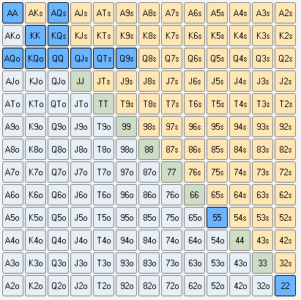 The concept of a hand range is often foreign to a beginner poker player, but once you understand the idea you will never go back to your old way of thinking. Keep reading to find out more. How often do you try to put your opponent on a single hand? Do you often say ‘I think he has Ace King’? Nobody, not even seasoned pros, can consistently put someone on a single hand – it’s just not possible given the amount of information at your disposal. The Hollywood scene where the main character has the uncanny ability to read an opponent’s exact cards time after time is completely unrealistic; you shouldn’t hold yourself to such high standards as it will only lead you to make mistakes. So the question is, what should we do instead of placing someone a single hand? The answer: we give them a range of possible hands or in other words a set of hands. So instead of ‘he can only have AK’ in a particular situation, we think ‘he can have AK, AQ, AA and some bluffs’. 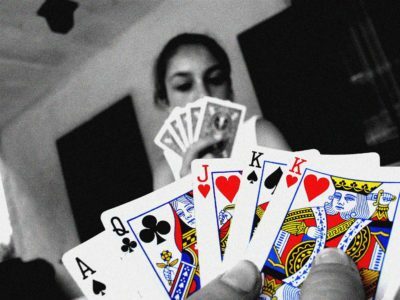 Hand reading then becomes about working out the hand range more accurately; not about finding a single hand that your opponent is holding. Why doesn’t the method of putting your opponent on a single hand work? Well for one, there are a lot of hands your opponent can typically have; therefore narrowing it down to one hand based on limited information is difficult, if not impossible. In addition, your opponents should play in a way that gives him multiple hands for the same line (series of actions). If you play a certain way or take a particular line with only ONE hand or hand type then you become very easy to play against. To take an example, it is very easy to play against someone who raises very large preflop with only AA or KK. We just fold! In order to hand read correctly, we need to piece together the story that our opponent is telling us. With every action (bet, raise or check) our opponent is giving us a piece of information. We must piece this information together to build up a possible set of holdings our opponent may have.We called this constructing a hand range. If we are on the river facing a bet we must take into account all the actions on the previous streets. In addition to simply what actions we both took, we must also take into account bet sizing and bet timing on EVERY street. You begin with a wide hand range and progressively whittle it down as more information becomes available. Each opponent action allows us to remove more hands from his range. Sometimes we can narrow an opponent’s range down to a few hands, but not always. 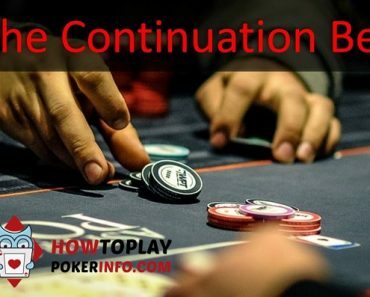 A common example would be that if someone calls your preflop raise you can typically exclude hands like AA, KK, and AK from their preflop hand range. 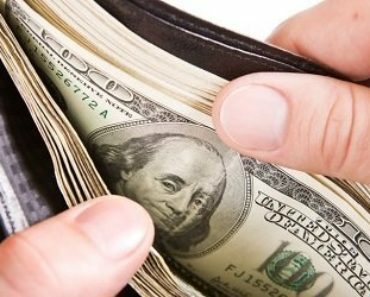 We can eliminate these hands as they will almost always be reraised preflop. Very few players will flat call AA, KK, and AK versus a raise. Piecing together all this information is a lot like a puzzle. It can be very difficult to keep all the information in your head during a hand; this is one of the key reasons that poker is such a difficult game to master. Although piecing the ‘puzzle’ together becomes easier with experience as you will subconsciously work it out. Practice will make perfect. The best way to explain a range is to do a full example. One of the main benefits of playing online is that you get to use a HUD(heads up display). 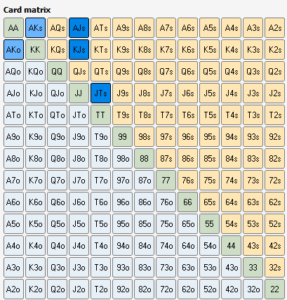 A HUD will give you information on what your opponent may be holding in a preflop scenario. So we can use our HUD to estimate what our opponent may be raising from early position – this allows us to make adjustments based on if he is raising a wide or narrow range. Vs a wide range we should fight back and call or raise might often. Vs a narrow range we should fold more often. To take an example, we are on the BTN with AQ and face a raise from UTG from an aggressive opponent. 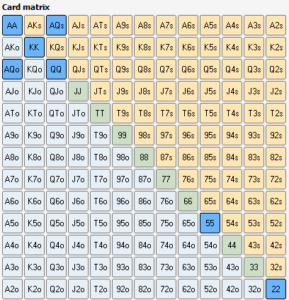 We see that the UTG raiser is opening 17% of hands (if this was a live game we would use an approximation). We choose to call in this situation and the blinds fold resulting in a heads up pot. The flop comes down Q♦ 5♣ 2♥ (rainbow board) and as a result, we have a very strong hand. Villain bets half pot and we call. Raising is not an option here because raising would fold out all his weak hands and only leaving strong hands. A large proportion of these strong hands are stronger than us – not an ideal situation. 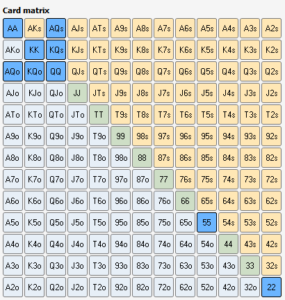 We expect villain’s betting range to be all top pair, overpairs such as AA and KK, and sets. He doesn’t have any two pair on this board texture. How did we arrive with theses ranges? Well first, we expect villain to continuation bet all of his top pair (we are assuming he is quite aggressive). We also know from past experience that this particular villain will not bet hands under top pair for value. So he either bets top pair or better, some bluffs or checks. In some cases, the villain will check QQ on the flop or turn but for simplicity’s sake, we assume he will bet the two streets. For bluffs, we think villain will bet all of his flush draws and some AK: AK, KJdd, JTdd, AJdd. It can be difficult when first starting out to determine what villain will do with each hand. This just comes will practice and experience. With AQ we can then decide to call or fold based on how much he bets. Vs this range AQ has 33% equity (from equilab). Therefore, if we are getting 2:1 pot odds (villain makes a pot sized bet) we can call, and if he bets larger we should fold. If our opponent bets smaller we should still obviously call. For more on pot odds see Pot Odds, Equity And Expected Value. One quick method of improving hand reading skills is to play without looking at your hole cards. Playing live this is easy, but online this might mean putting a sticker on your screen over your cards. When you can’t see your own cards you have to focus on figuring out what your opponent may be holding as opposed to how your hand matches up with the board. This focus improves your skills rather quickly and is a great drill to perform even if you’re a seasoned poker player. 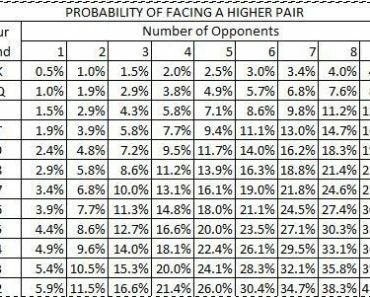 A word of warning, however: you are obviously at a great disadvantage when you can’t see your cards so play the lowest stakes possible to avoid large losses. Any loss can be seen as the price of your education. Otherwise you could check out Splitsuit’s course: The hand reading lab. This course is focused on one single objective: improving your hand reading ability. Once you have understood what a hand range is and how to apply it on the table, you won’t go back to the ‘beginners’ way of thinking. 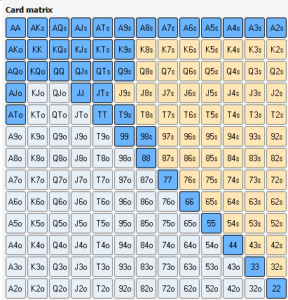 The concept of putting your opponent on a range starts as almost a guessing game during the early poker career; but as your skills improve so does the accuracy of your hand range estimations. Strive to improve your hand range construction skills as this is in essence how you will exploit your opponent. Ultimately, with the best hand reading skills, you will come out the biggest winner at the tables. Further Reading: My favourite poker book, Applications Of No Limit Holdem By Mathew Janda covers hand ranges in a huge amount of detial. 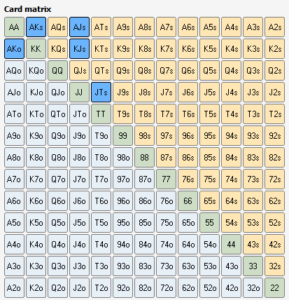 I would recommend checking it out on our best poker books page to find out more.